Challenges in Middle Atmosphere Dynamics and Societal Benefits, Springer Nature, ISBN 978-3-319-75140-5, 1167 pp. 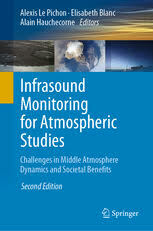 Since the publication of the first volume “Infrasound monitoring for atmospheric studies” published in 2010, significant advances were achieved in the fields of engineering, propagation modelling, and atmospheric remote sensing methods. The global infrasound network, which consists of the International Monitoring Network (IMS) for nuclear test ban verification completed by an increasing number of regional cluster arrays deployed around the globe, has evidenced an unprecedented potential for detecting, locating and characterizing various natural and man-made sources. In recent years, infrasound has evolved into a broad interdisciplinary field encompassing academic disciplines of geophysics and innovative technical and scientific developments. The advances in innovative ground-based instruments, including infrasound inversions for continuous observations of the stratosphere and mesosphere, provide useful insights into the geophysical source phenomenology and atmospheric processes involved. Systematic investigations into low-frequency infrasound signals and the development of complementary observational platforms point out new insights into the dynamics of the middle atmosphere which play a significant role in both tropospheric weather and climate. This monitoring system also provides continuous relevant information about natural hazards with high societal benefits, like on-going volcanic eruptions, surface earthquakes, meteorites or severe weather. With this new edition, researchers and students benefit from a comprehensive content of both fundamental and applied inter-disciplinary topics.disciplines of geophysics and innovative technical and scientific developments. The advances in innovative ground-based instruments, including infrasound inversions for continuous observations of the stratosphere and mesosphere, provide useful insights into the geophysical source phenomenology and atmospheric processes involved. Systematic investigations into low-frequency infrasound signals and the development of complementary observational platforms point out new insights into the dynamics of the middle atmosphere which play a significant role in both tropospheric weather and climate. This monitoring system also provides continuous relevant information about natural hazards with high societal benefits, like on-going volcanic eruptions, surface earthquakes, meteorites or severe weather. With this new edition, researchers and students benefit from a comprehensive content of both fundamental and applied inter-disciplinary topics. 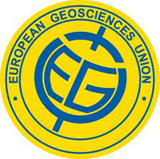 A session dedicated to “Infrasound, acoustic-gravity waves, and atmospheric dynamics” ad partly to the ARISE project is organized at the EGU since the beginning of the project (2013). This session is now a double session attracting many scientists involved in the study of the middle atmosphere and infrasound monitoring for societal applications. ARISE splinter meetings are organized in parallel for project work.